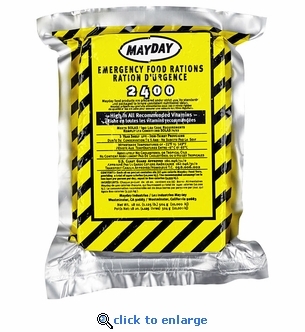 Mayday 2400 Calorie Emergency Food Bars are the perfect size rations for survival kits and emergency preparedness supplies. Each air tight vacuum sealed package includes 6 individual servings of 400 calories each. Each 2400 calorie food bar provides the nutritional needs of one person for two days in an emergency situation. These great tasting apple-cinnamon food rations are prepared and baked under strict supervision to maintain the highest quality. Keep few of these emergency food bars in your car glove box, boat, RV and camping gear for unexpected emergencies. Ingredients: Enriched Flour, Vegetable Shortening, Sugar, Corn Syrup, Soy Flour, Cornstarch, Potassium Sorbate, (Vitamins listed below), Artificial Lemon Flavoring, Artificial Vanilla Flavoring, Artificial Butter Flavoring, Artificial Coloring (Egg Shade).